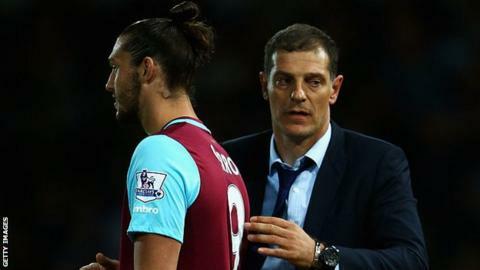 West Ham manager Slaven Bilic has ruled out selling striker Andy Carroll during the January transfer window. Carroll has been out with injury for much of this season and has been linked with moves to Sunderland or former club Newcastle. But he recently returned with two goals in two games and Bilic said: "We don't want to sell him. "He's very good in the dressing room and I know he's happy here. The club aren't willing to listen to offers." Carroll, 27, has scored in wins over Southampton and Liverpool to propel the Hammers to sixth in the table. "Whenever he scores a couple of goals the rumours start," Bilic said. "The only way he can stop the rumours is to play badly, which we don't want."